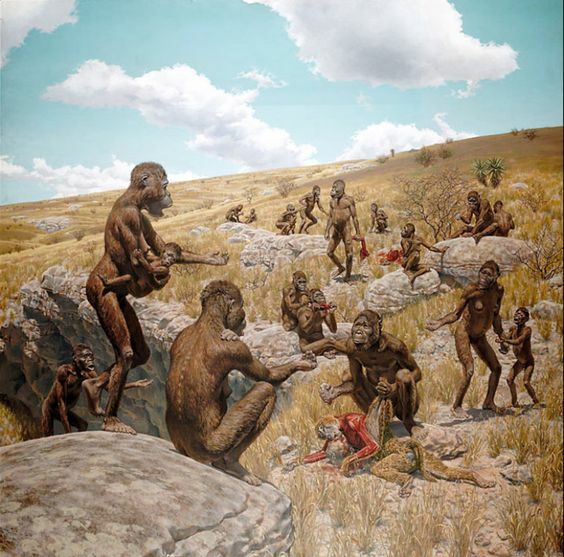 The Australopithecina (australopiths) are a subtribe of the Hominini (hominin) tribe, which is also called the human clade. The australopiths are thus the closest relatives of the human genus Homo, from which emerged modern humans (Homo sapiens). Australopithecus species are also called the gracile australopiths, while the Paranthrophus species are the robust australopiths. 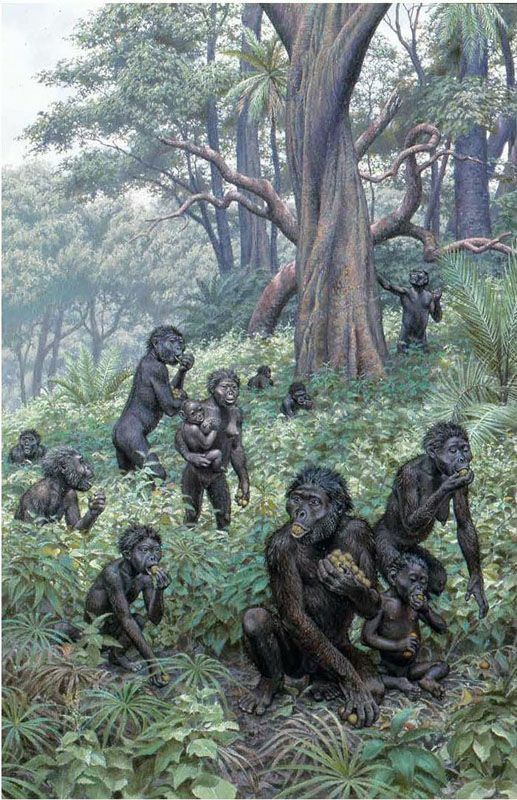 The Ardipithecus appeared earlier, and may have been the ancestors of the other australopiths. 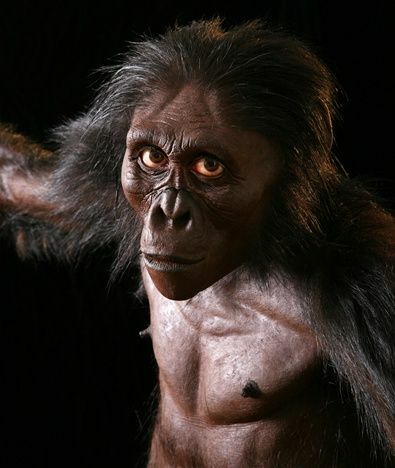 The australopiths lived from around 5 million to at least 2 million years ago (during the Pliocene-Pleistocene era) in southern and eastern Africa. The first autralopiths—probably similar to Orrorin or Sahelanthropus—had branched off from the chimpanzee lineage around 7 MYA and were probably chimpanzee-like in many aspects of appearance and behavior, including brain size. However, they were already bipedal (i.e., habitually walking on two legs) and had similar dentition and probably similar diets as later Homo populations. While there is no direct evidence of tool-fashioning, there are indications that they used rudimentary tools of stone, bone and sticks. Of particular interest is the species A. afarensis, which most scholars consider closest to the Homo genus. Afarensis fossils are found in areas that during 4-3 MYA were mainly mixed savanna and woodland environments. A. afarensis appear to have eaten fruits, leaves, nuts or grains, and some tubers and roots, and possibly a bit of animal meat (including small fish, birds, lizards and their eggs). They most likely lived in groups consisting of several adults plus young. Australopithecus afarensis is one of the longest-lived and best-known early human species—paleoanthropologists have uncovered remains from more than 300 individuals! Found between 3.85 and 2.95 million years ago in Eastern Africa (Ethiopia, Kenya, Tanzania), this species survived for more than 900,000 years, which is over four times as long as our own species has been around. It is best known from the sites of Hadar, Ethiopia (‘Lucy’, AL 288-1 and the ‘First Family’, AL 333); Dikika, Ethiopia (Dikika ‘child’ skeleton); and Laetoli (fossils of this species plus the oldest documented bipedal footprint trails). Similar to chimpanzees, Au. afarensis children grew rapidly after birth and reached adulthood earlier than modern humans. This meant A. afarensis had a shorter period of growing up than modern humans have today, leaving them less time for parental guidance and socialization during childhood. Au. afarensis had both ape and human characteristics: members of this species had apelike face proportions (a flat nose, a strongly projecting lower jaw) and braincase (with a small brain, usually less than 500 cubic centimeters —about 1/3 the size of a modern human brain), and long, strong arms with curved fingers adapted for climbing trees. They also had small canine teeth like all other early humans, and a body that stood on two legs and regularly walked upright. Their adaptations for living both in the trees and on the ground helped them survive for almost a million years as climate and environments changed.